The Meetings Show UK has commissioned independent research that will shape its education programme. Corporate and agency meeting planners, as well as suppliers, will be targeted in the research into the key issues facing the industry. Results will be fed back to the Meeting Show UK’s Advisory Board and Education Panel in early 2013. The Meetings Show UK event director Steve Knight said: "At the inaugural Advisory Board and Education Panel meetings, it became clear an effective education programme should be tailored to the key delegate types, with detailed research providing the backbone of the content. "Education is a key ingredient in our show and not just an 'add-on'. This is reflected in the fact we are not holding sessions on the show floor but using the recently refurbished Olympia Conference Centre and The Queen Elizabeth II Conference Centre." Zibrant managing director operations Chris Parnham, a member of the Meetings Show UK’s Advisory Board said it was "vital" for the content to "reflect the needs of the attendees, fill gaps in their knowledge and demonstrate that both organisers and speakers are responding to changes in the industry". 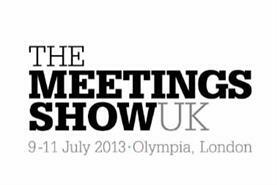 The Meetings Show UK's inaugural event will take place 9-11 July 2013 at Olympia, London.